Sage Security Solutions installs only the best in IP video security cameras, CCTV cameras, video surveillance and video security systems. IVT Vision is the leader in innovative IP camera and NVR solutions for the commercial market. They provide the most dependable cameras and recording devices produced. IVTVision Professional VMS creates an advanced security solution, providing recording of the latest, state-of-the-art IP video surveillance cameras. The powerful, easy-to-operate client user interface installs on any standard computer running Windows, Linux or Mac OS X and can connect to multiple IVTVision Hybrid (analog and IP cameras) and IP Camera Servers creating a virtually unlimited amount of cameras and protection. Video from all IVTVision systems can also be accessed with web browsers and mobile devices with access to the internet. Each server expandable up to 64 IP cameras (24 IP cameras on Linus-Series appliances, and up to 96 IP cameras on Windows-Series servers). Simple and cost-effective to add additional IP camera licenses. 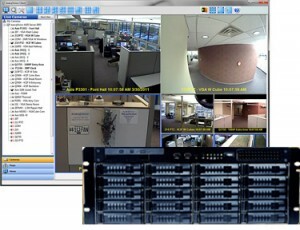 Supports IP cameras and encoders from multiple manufacturers. Supports latest IP camera technology including megapixel cameras, H.264 and analytics. Intuitive user interface requires little to no training. Common client connects to multiple IVTVision servers to create scalable networks. Easy-to-use, powerful video, audio and POS export features. Multi-monitor client display & Video Wall. Drag and drop cameras and maps between monitors. Graphical search display for all cameras and recorded audio. Easy to use multi-camera search, playback and export. Powerful mapping feature integrates seamlessly with video streams. Add any number of maps from any image source, place cameras and alarms on map, watch interactive activity on map. NEW – Audit Trail – enables managers, internal investigators and auditors to search, view or export system actions performed by any system user, such as login/logout, viewing/closing cameras, and configuration changes. Server software runs on standard Windows and Linux platforms. Unlimited number of clients can connect to every server. Client software operates in Windows, Linux and MAC OSX. Small footprint client: 13MB total including help files. Browser thin client also included for viewing and playback in any web browser. Enterprise Users – easily administer user accounts and privileges across the enterprise with a single entry. Active Directory / LDAP support – integrates with existing Active Directory or LDAP servers. Multi-level Mapping – create nested maps-within-maps where events in nested maps can appear on top-level maps. Ideal for enterprise deployments where there may be maps of the campus, individual buildings, floors in the buildings, specific wings on the floors. NEW– Enterprise Cameras – single-screen, real-time view of all cameras in the enterprise system. Sortable by connection, recording status, IP address, firmware revision, etc. Double-click any camera for that camera’s setup screen. Right-click any camera for live or instant playback via IVTReplay. Web server and viewing capability included: view, search and playback video from any standard browsers, using the browser-based thin client, no ActiveX support required. Basic live view from any WAP mobile browser, which includes most non-smart phones. Real-time configurability of resolution enables use in bandwidth-restricted environments. Language Localization – Select between English, French, German, Norwegian, Danish, Finnish, Swedish, Dutch, Spanish, Catalan/Valencian, Polish, Slovak, Arabic, Chinese, Japanese, Korean, Russian, Hungarian. Integration with leading access control systems, retail analytics, iSCSI storage, Wireless Networking, Video Analytics, and more. IVTVision VMS software is frequently updated to support new cameras, access control systems, and new features. First year of updates come standard; additional years available.